Following the elementary school shootings in Newtown, Connecticut in late 2012, this quote flooded my Facebook feed. In the midst of tragedy and unthinkable evil, these words from everyone’s kindest neighbor helped us remember that good can still be found. That people can be unimaginably bad, but also that there is the potential for compassion in those situations. I love the wisdom found in these words, no matter where in these situations you find yourself. For those directly in the path of the evil, this can be a profoundly important reminder. Fear can keep our eyes open only for those inflicting harm, rather than reaching out to those who are there to offer aid and comfort. There can be a guardedness that makes us distrust everyone around us, even those who are there to help. It is important to remember to search for safety in the midst of horror. For those who are a bit more removed, there is also truth. We may be tempted to look upon awful situations and see only the ways that people are causing hurt. The 24-hour news cycle has conditioned us to sensationalize evil and largely ignore those who are offering support to those caught in the middle of suffering, which may diminish the importance of those doing that work. When news of my affair broke loose and I flipped my entire life completely upside-down, this was advice that I could have used. Even though I was the architect of my own tragedy, it didn’t mean that I wasn’t smack in the middle of a pile of hurt. I shut myself away from everything because while I knew I didn’t want to hear from the nay-sayers, I also didn’t think that I deserved to hear from the helpers. 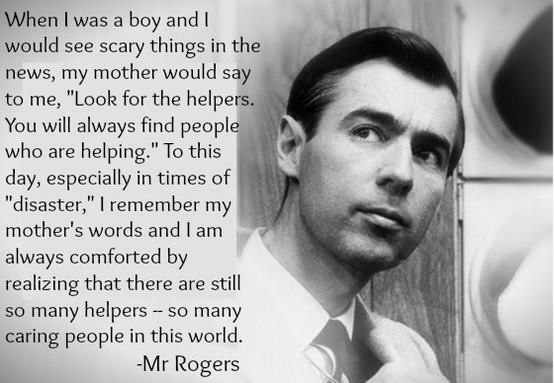 I think that sometimes we shame people from looking for the helpers. We accuse them of wanting to have their ears tickled or of only wanting to hear from those who agree with them. People who have caused pain need truth and that needs to be delivered in a particular way. Regardless of why we’re stuck in pain, we all need helpers. Even when we are the authors of our own painful stories, we still need to be reminded that we are more than our worst moments. We need to be told that we have value beyond our ability to hurt others. We need to know that we are still lovable even when we have behaved in ways that are unloving. When I was able to listen to those messages and allow them to start to sink in, I could see some of the more nuanced ways that my actions caused pain. In acknowledging my own hurt, I could better see how that led me to the choices that I made, which allowed me to find my way toward the repentance that needed to happen. I did need truth at that time, but the truth that was most helpful at the start was that which reminded me that I was loved. The truth that I needed was that I was cared for. The truth that I needed was that I could be whole again. Embracing those truths allowed me space to be vulnerable enough to accept some of the more difficult truths that I needed to hear. When we restrict access to the helpers, either as people on the outside or even when we restrict ourselves, we risk prolonging the hurt. If you are hurting and you need a helper, that’s okay. In fact, it’s better than okay, it’s important. It doesn’t matter if you’re hurting because of what someone did to you or if it’s something that you did to yourself. Find the space that will allow you to begin healing and the people who can offer care and comfort to allow that to happen. Remember that we were not meant to go through this life alone and that accepting help is part of the process of growing. And after you have been helped, take time to become a helper who is easy to find, because there are always people who are looking. This entry was posted in Forgiveness and tagged adultery, forgiveness, helpers, judgment, Mister Rogers, repentance, truth. Bookmark the permalink.